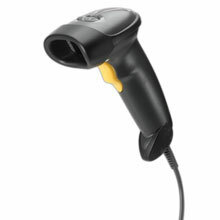 Used in conjunction with HP Point of Sale System rp5000 and rp5700, the Barcode Scanner is a small, lightweight handheld scanner which scans from industry-standard barcodes for fast and easy input of retail information. Offering superior performance, excellent reliability and user-friendly comfort, the Barcode Scanner helps create a more productive retail environment. EY022AA	 USB kit. Includes scanner, USB cable. The HP EY022AA is also known as Hewlett-Packard	EY022AA	.